Calcium is present in many foods and we should certainly use this to preserve healthy teeth and have strong bones. As we grow older this mineral is less absorbed, it must sometimes be administered in the form of pills and supplements because in this way we compensate for the lack of calcium in the body. What are the foods rich in calcium and magnesium, and how they prevent osteoporosis, cardiovascular ailments and other health problems read bellow. A good metabolism of minerals is particularly important in childhood, when bones grow, as well as in old age, because with age we decrease the ability to absorb it, and therefore it is extremely important to include calcium in the diet. Nearly 1.5kg of total body weight is occupied by calcium, about 99 percent of the bones and teeth, while the rest is in the nerves, muscles and blood. This mineral is essential for skeletal rigidity, starting from early childhood through to old age. In conjunction with magnesium, calcium is needed for nerves and muscles to trigger the correct function, promotes blood clotting and contributes to preserving the acid-alkaline balance. A constant level of calcium in the blood is essential for smooth important processes in the body. Unfortunately, the human diet is very low in calcium, and other vitamins and minerals. Milk and dairy products are often held up as the only and the best sources of calcium, but there are richer sources of this mineral. Also its absorption is very important, and this is affected by many factors. There are two ways to supply the organism with this precious mineral. The first and best way is calcium in food which should be brought in sufficient quantities. However, if you do not consume enough foods rich in calcium, the body will be forced to be drawn it from the bones, which in the long run is not good. Nutrition is the key, especially for people under 30, because building of bone mass is still happening. This will help you in later years to avoid osteoporosis. In addition to dairy products, which we have already mentioned, there are a number unjustly neglected plant sources of this important mineral. One of the most important is certainly the sesame seeds, which contains seven times more calcium than milk, again this is something that is quite a little known fact. It is best to eat it in raw or ground form, in addition to cereals, pastries, homemade bread, and yogurt. Calcium in food can be found in dried figs and this fruit is one of the outstanding foods rich in calcium. Just 100 grams of fruit satisfies 35% of daily needs for this mineral. If you have been diagnosed with a lack of calcium, you will not go wrong if you eat dried figs. Chickpeas are also rich in calcium, but also magnesium, which is very important for the absorption of calcium. Other good sources of calcium include: carob, almonds, kale, shell egg, broccoli, peanuts, walnuts, sunflower seeds, sardines, the list is quite long. Every doctor will recommend some of these foods, if your problem is brittle bones, calcium-rich foods are the best prevention for this. To make the body absorb this mineral, it is necessary to intake sufficient amounts of vitamin D, the lack of which increases the risk of reduction in bone mineral density and, consequently, leads to fractures in elderly that causes unpleasant osteoporosis. Therefore, it is necessary to spend enough time in the sun and eat foods rich in vitamin D, such as marine fish (mackerel, salmon, and tuna) or milk and dairy products enriched with this vitamin. Vitamin D deficiency can be corrected by taking supplements of this vitamin, it is understood only as recommended by your doctor, never alone-on your own. If you consume calcium through food, you also need vitamin D for it to be properly absorbed. Also excessive consumption of protein is harmful, because it leads to loss of calcium from the body, because the meat contains high levels of phosphorus, which interferes with the absorption of this mineral. Numerous studies have shown that vegetarians lose less bone mass than non-vegetarians. Therefore, meat and other foods of animal origin should be replaced as often with plant sources of protein, such as, for example, legumes. Excessive intake of salt also causes a loss and a lack of calcium. Limit the amount of seasoning and spices to tone down the meat products (which are rich in salt), and salty snacks, ketchup, canned food. Caffeine, alcohol disrupt the absorption of calcium so you should avoid it as well. Foods that create an acidic reaction also "steal" calcium, and you need to eat more food, which has a basic pH, because calcium in food is found in fresh fruits, especially citrus, and vegetables, almonds, millet, local honey, olive oil, dried apricot , herbs and other. We recommend article alkaline foods. Magnesium helps the body absorb and retain calcium, but these two minerals closely "cooperate" in building and strengthening the bones, and consequently prevent osteoporosis. Since body does not create reserves of magnesium, it is important to take it through the daily diet. Calcium and magnesium in food are found in nuts, seeds, whole grains, legumes, seafood and many types of vegetables. Chlorophyll is also very important to magnesium and is an essential ingredient that can be found in green vegetables. Magnesium deficiency is closely associated with cardiovascular disease: patients deceased due to heart attack and stroke had abnormally low levels of this mineral in the body. Calcium in foods and magnesium together improve the general condition of the body, help in the treatment of various diseases and disorders, but also speed up the metabolism, provide better working muscles, renew our bones, teeth, hair, skin, strengthen the heart and do not allow the serious decline in immunity, but boost it. Calcium in food is sometimes not sufficient, and our doctors recommend that we take this mineral in the form of tablets or supplements. It is not good practice to do this alone, because it can lead to overdose but this is quite rare, so always follow the instructions and consult with professional before you start taking calcium tablets. The daily dose of calcium for adults of 25 years of age is an amount of 1.000 to 1200 mg, over 25 years 800-1000 mg. Calcium in pregnancy and during the period of breast-feeding can be taken in an amount no higher than 1,200 mg. After entering menopause women need calcium and the daily dose is up to 1,200 mg daily. In children, up to 60 percent of the calcium from food is absorbed in the intestine, because the young body needs a lot of minerals to build bones. In adolescence, the adoption of calcium is reduced to 15-20 percent, but with aging it can be further reduced and then calcium in food becomes an indispensable part of the menu. This mineral is particularly important in a period of intense growth and development, when a lack of calcium can cause growth failure and deformities of the skeleton. 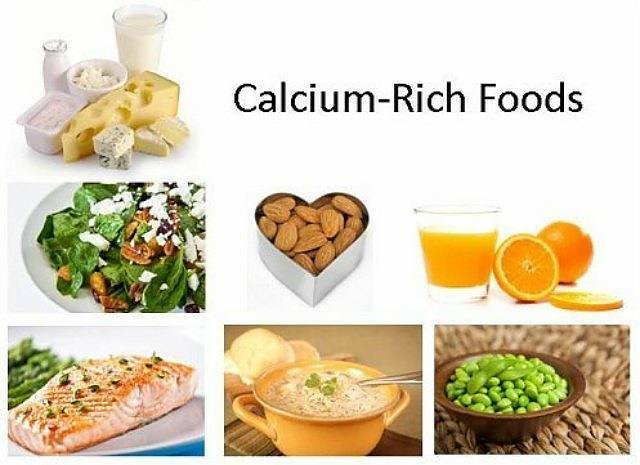 Calcium is essential in foods in postmenopausal period, when there is a risk of osteoporosis because then we have weak bones. People who do not tolerate lactose, but must avoid milk and milk products are also potentially vulnerable due to insufficient intake of the same. More in the text lactose intolerance. Since the body absorbs the minerals according to its needs, there is no greater risk of overdose with supplements, except in extremely rare cases (if there is damage to kidneys or if the person at the same time drinks large doses of vitamin D). When calcium in food becomes insufficient, recommended are pills and supplements. This mineral can be found in the following forms: calcium citrate, calcium carbonate, calcium gluconate, calcium aspartate, calcium lactate, and hydroxyapatite. Calcium carbonate is poorly soluble, difficult to absorb and also side effects can occur: nausea, gas and constipation, which can be alleviated by taking magnesium. It is consumed with food, so it is better absorbed in the presence of gastric acid. Generally minerals are better absorbed in the acidic environment, so a good solution is calcium citrate, which is taken on an empty stomach, but needs to be avoided by people who have problems with excess acid. When it comes to supplementation, one must always keep in mind the amount of real elemental calcium: for example if the label indicates the content of calcium carbonate or calcium citrate, we should recalculate the quantity of calcium. For example, 500 mg of calcium carbonate has 200 mg of elemental calcium. Therefore, the calcium content is 40 percent in calcium carbonate, 21 percent in calcium citrate, 13 percent in the calcium lactate, 9 percent in calcium gluconate. Each of these types is absorbed better when taken in a dosage of 500 mg or less. If you need to take higher doses of this, it is better to divide them in two or more smaller doses. If the deficit and the lack of calcium is small, it is better to avoid supplements and opt for a diet rich in calcium magnesium and vitamin D.